The Kelly skirt by Megan Nielsen. So you want to make Megan Nielsen’s Kelly skirt, but it doesn’t come in your size? Whether you need a plus size like XXL, or 3X, or a smaller size, like XXS there is an easy solution – grading the pattern. Grading a pattern just means to take a pattern up or down a size, or more. There are many ways to grade a pattern, and lots of articles on how to do this. It can be a complex process, depending on the pattern. But it doesn’t have to be. In fact, if you have never graded a pattern, the Kelly Skirt is the perfect one to start with. This skirt fits waists between 26 and 34 inches (66-86 cm). In commercial pattern sizes, that translates roughly to sizes 12 to 20. That is a pretty good range, but we can easily extend that range. This week I published my own version of the Kelly Skirt and I mentioned that it is an easy pattern to grade. I recently had my fourth baby, and although I would normally be a size large in the Megan Nielsen size range, my waist is (temporarily I hope!) larger than the largest size included in the pattern. I graded the pattern up a size. I am not an expert pattern grader, this is just the way I graded the pattern. Since it worked out well, I thought I’d share. In order to grade the pattern, you will need to trace the pattern onto tracing paper, with a few simple modifications. If you have never traced a pattern before, I suggest you read “How to Trace Sewing Patterns” by Sunni on a Fashionable Stitch. There are also some good photos of the process here. You will need tracing paper, a pencil and a ruler. 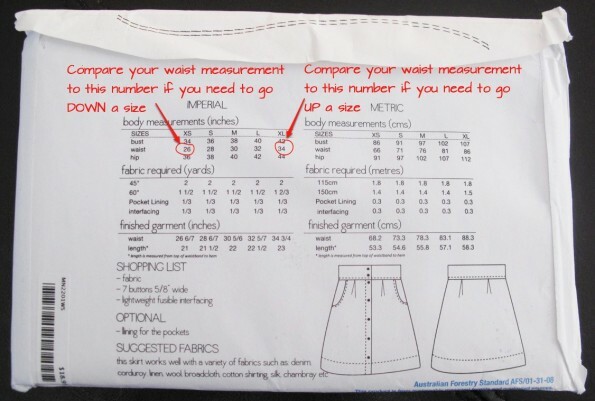 You will start by comparing your measurements to the closest pattern size. You can ignore the bust measurement completely. Because the skirt is gathered and has a fair bit of room in the hips, in most cases, you can just look at the waist measurement. However, if you have very large hips, compared to your waist, you may need to make more complex modifications. For this tutorial, we’ll assume your hips and waist are roughly proportional. What measurements to look at when grading the Kelly skirt. If you are going up a size, compare your waist to body measurements for the largest pattern size. The waist measurement given for the XL size is 34 inches. My waist is 37 inches at the moment. That means I need to add 3 inches to the XL size. Make sure you are looking at the body measurements and not the finished garment measurements. The finished garment measurement won’t be skin-tight, it should have some ease or breathing room, so that the clothing will be comfortable to wear. This pattern has around 3/4 of an inch of ease at the waist. Professional pattern graders adjust the ease in very precise ways, but we’ll just use the ease of the closest size (XL or XS). If you are going down a size, compare your waist to the to body measurements for the smallest pattern size. The waist measurement given for the XS size is 26 inches. If you have a 24 inch waist, you would need to subtract 2 inches from the XS size. Again, make sure you are looking at the body measurements and not the finished garment measurements. There are only 5 pattern pieces in the Kelly Skirt. 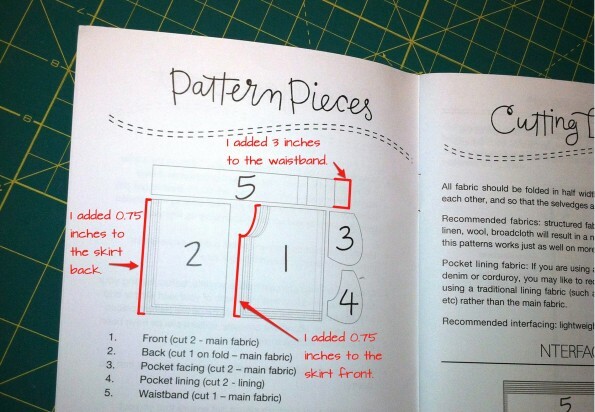 There are only five pattern pieces for the Kelly skirt. You will trace the pocket facing and pocket lining as they are. These two pieces don’t change when the skirt size changes. The waistband is a single piece that circles the waist. In the XL size, this piece is made for a 34 inch waist. Because I have a 37 inch waist, I need to add 3 inches of length to this piece. I added the length to the XL size at the end without the markings, just because it is a little easier that way. Don’t forget to transfer all the markings to your tissue paper. If you are going down a size, subtract the amount you need from the XS size. This will shorten the waistband. Keep in mind that the piece won’t measure exactly 37 inches after my modification. That is because the length of the pattern piece also includes seam allowances. I write the changes I’ve made directly on the tracing paper as a reminder. The modified waistband for the Kelly skirt. The skirt front and skirt back need to be modified as well. I need to add 3 inches, but I need to split this amount between the two seams that join those pieces together. That means I need to add 1.5 inches to each seam, and 0.75 inches to each pattern piece at that seam. Modifications to the back of the Kelly skirt. The skirt back is cut on the fold. I just extended out the side that is not on the fold by o.75 inches. 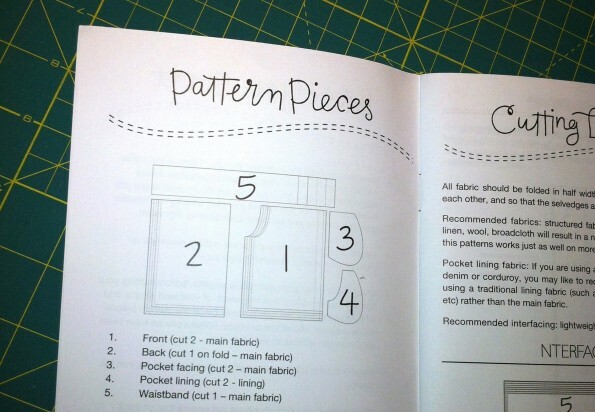 Because the piece is on the fold, that amount fill be added to each side of the pattern piece. 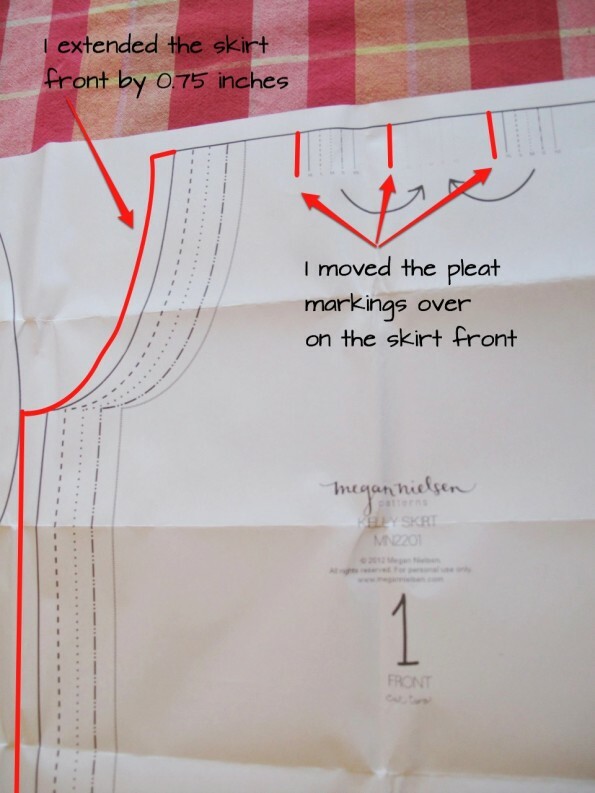 You will also have to move the markings for the pleats on the skirt back. If you don’t, the pleats might look a bit odd, and strangely placed. If you are going up a size, starting from the markings for the XL size, for two inches that you added to the waistband, move the pleat markings out, away from the fold, by 1/4 inch. (The pleat markings are more precisely spaced than 1/4 inch intervals, but this number will serve as a good approximation for us.) If you are going down a size, starting from the markings for the XS size, for two inches that you subtracted from the waistband, move the pleat markings in, toward from the fold, by 1/4 inch. There are three lines that need to be moved. Modifications to the front of the Kelly skirt. The skirt front is in two pieces. I extended out the side with the curve for the pocket by 0.75 inches. This adds 0.75 inches to each piece. Again, I moved the markings for the pleats over exactly the same way as for the skirt back. These are the changes I made to the Kelly skirt. What about the skirt length? If you are going down a size, it’s probably a good idea to keep the length of the XS size, unless you are also shorter than average. After all, it is easier to take the hem up a little more than to be stuck with a skirt that is shorter than you were expecting. If you are going up a size, you can probably also stick with the XL length, unless you are also taller than average. I used the length of the XL skirt and I’m quite happy with the results. However, you need to make sure that there is enough skirt so that when you are sitting, you can sit on the skirt, and not on the hem. If you are quite a bit larger than the pattern XL size, and your pattern modifications are substantial, you may also want to add some length so that you can sit comfortably. The finished skirt length of the XL size is 23 inches. Compare this to a skirt you own, to see if this is sufficient. That’s it! Now assemble the skirt following the instructions. Kelly Skirt by Megan Nielsen in linen with black piping. I hope you have found this useful. If you have any tips for making this process a little easier, please leave them in the comments. So glad you like the tutorial! And thanks for stopping by. 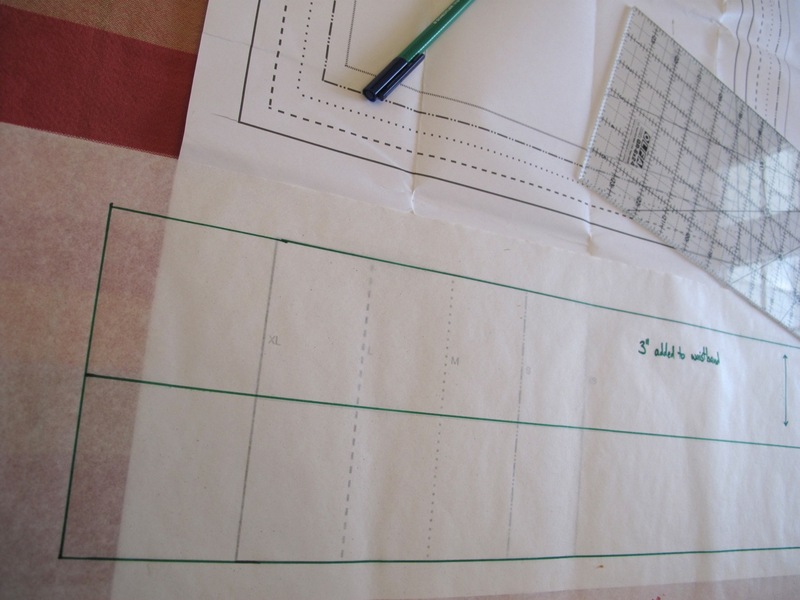 Your pattern is really great so it’s exciting to see the actual pattern designer read my post. This is why I love working with patterns from independent designers. Keep up the good work! Hi! Thank you so much for posting this, I just used it to grade my skirt up by 4 inches. I had a little trouble drawing the curve for the skirt front, but then I had a “duh” moment and used the pocket lining pattern piece as a guide to draw the extended curve, if that makes sense.